Header layout affects number and position of areas where you can place microwidgets (top bar right, top bar left, etc). 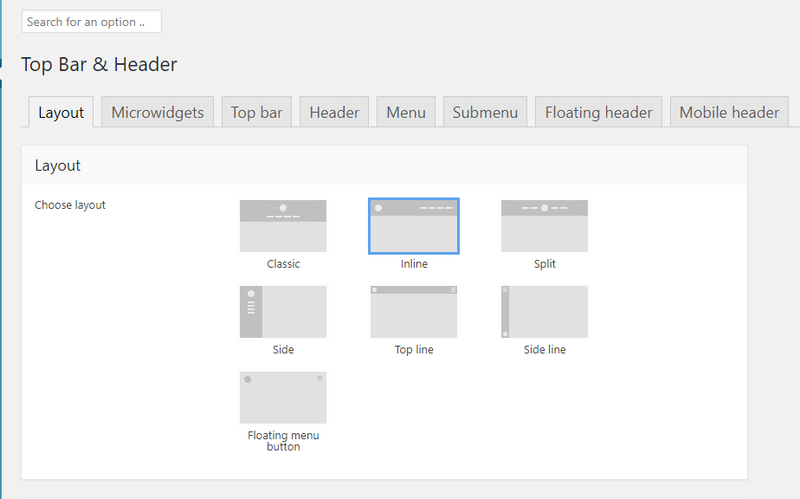 Header layout options also allow you to configure spacing between elements (fig. 4). Fig. 4. “Area near menu” paddings. cart (when WooCommerce plugin is activated). Fig. 6. Top bar background. Note: To edit Contents in topbar like Address, Phone number, email etc, you need to edit Micro widgets added to topbar location, refer to Microwidgets section for details. “Navigation on click” headers style (if “Side navigation on click” or “Overlay navigation” is enabled): header shadow or line decoration, background overlay properties (colour, opacity, “close” button). Fig. 7.1. Enabled full-width links. Fig. 7.2. Disabled full-width links. decoration styles for horizontal headers (colour outline or background for hovers, animation, etc). select sideways or downwards layout if you use side navigation. floating header height, colour and decoration (shadow, line, disabled). Fig. 11. Mobile header layouts. Fig. 12. Mobile menu alignment.